This portal was redesigned and opened in January 2015 to provide school districts with a tool that allows local decision making as to who is responsible for completing the different school finance reports. Security for school district staff and end users that grants them permission to enter data for their school district has been elevated based on the reality of how the Internet operates. The information in this document is designed to assist your school district in working through the related processes that follow. In the previous PI-1500, the software would provide each new account with an ID and a Password. The upgraded PI-1500 places the responsibility with the school district. It is recommended that your school district establish an IT security policy/protocol with regard to creating an ID and password. This policy/protocol will benefit your new employees and assist those assigned to grant them access to your IT systems. Normally the superintendent and at least one designee must provide the new employees with their User ID, email address and related duties. The school district's IT Security policy/protocol should speak to the conditions that would allow a third-party representative to be granted access through the PI-1500. 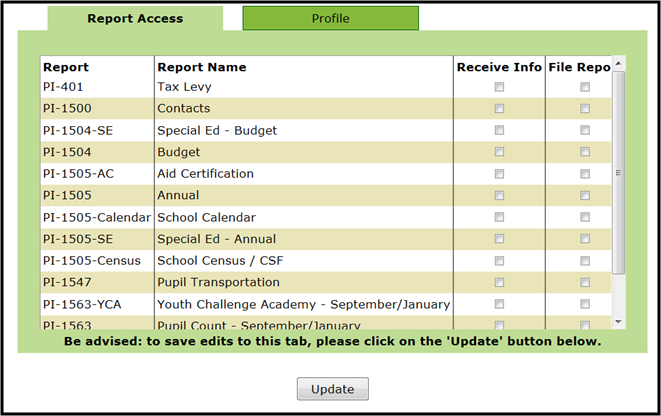 an "inactive" user is someone with no current authority to enter data on behalf of the school district but their name may appear on past reports or documents. "Please enter a full or partial school district, CESA, or county name in the box provided. If you know the LEA (Local Education Agency) number, you may enter that"
in the box below this statement. By clicking on the "Go" button, they will advance to the district's home (portal) page. If an individual ever forgets their password, it is that individual’s responsibility to recover and change their own password. The link changing an individual’s password will provide the information needed. 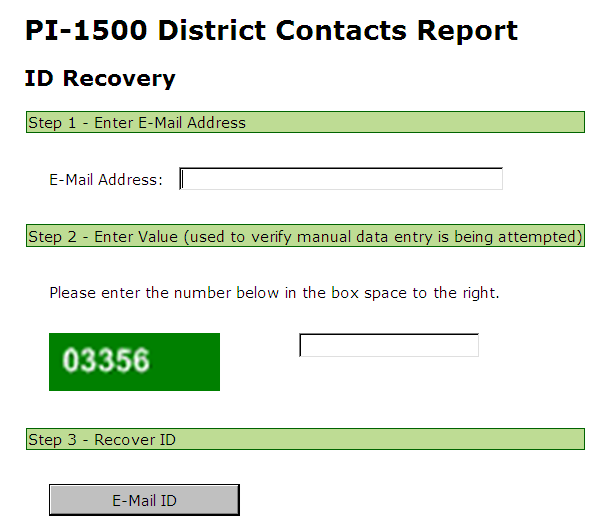 Go to the PI-1500 District Contacts Report. At the center-bottom of the information is the Log In box. Please Log In. You are now at the PI-1500 home webpage. Above the information (displayed in the screenshot below) will be the school district's name and LEA code. To the right of the school district’s name will be the "Add User" button, which will take you to a pop-up screen (below) with three options. 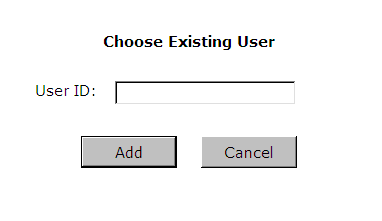 To enter a new user, select "Create New Account". This employee’s permanent "User ID" should follow district protocol/IT Security policy. Original/temporary "Password" must be entered twice. 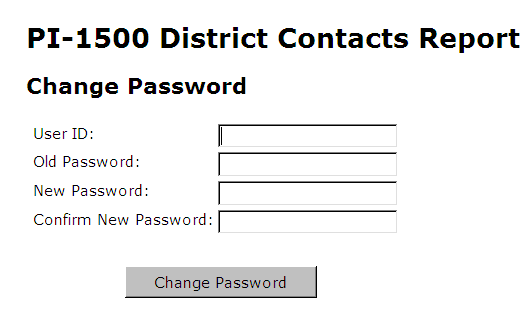 Email address provided by the district or approved by the district. After you click "Create New Account," this message will appear in the bottom of this box: "The user account was successfully created." Click the cancel button and remember to work through the tabs on the main screen to set up the report permissions, profile and security information for the new account. Click the "Cancel" button to return to the home page. Provide a new user with needed information. From the upper right-hand corner of the PI-1500 home page (screenshot below), "export user summaries to" select "PDF" and provide the new employee with a copy of this document. This document will provide all the information the new user needs, excluding their individual password. It provides the user with a list of other employees who do the same reports and thus can be a reference. Remember, none of this information is confidential. This document will not show anyone's password. Each new user will be expected to go through "Forgot your password?" to create their new password. "Cancel" takes you back to the original screen. 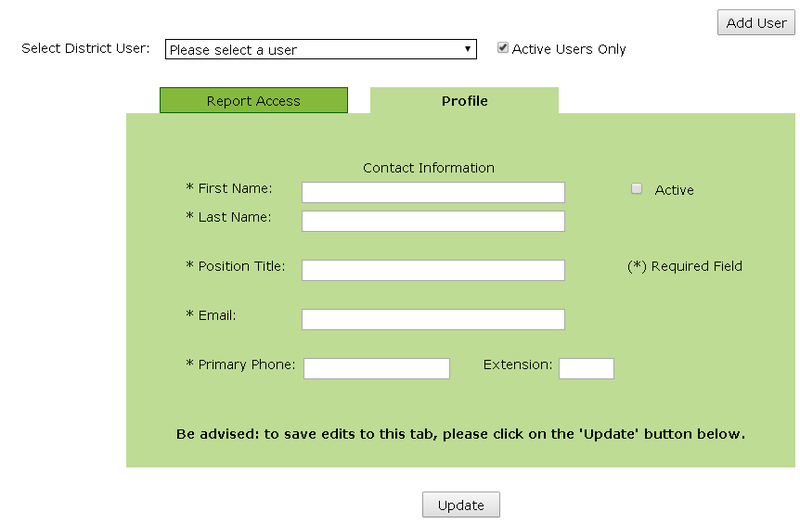 Under the "Profile" tab, enter or modify the individual’s information as shown in the "3.a" screen shot above. At the bottom of the pop-up screen it reads: "Be advised: to save edits to this tab, please click on the 'Update' button below"
If not all the required information has been entered and you click the "Update" button, the website will warn you with a new pop-up screen. The PI-1500 will also use a pop-up screen to let you know that all the required information has been entered: "Success - The Changes HAVE been updated." By clicking on the "Close" button you will return to the PI-1500 website. Under the "Report Access" tab, this individual can be granted access or have it removed for the reports listed. By clicking on the "Receive Info" box, this individual will receive DPI/SFS information via email related to that report. By clicking on the "File Repo" box, this individual has been granted the authority to enter data in that reporting portal on behalf of the school district. It is not necessary to click both boxes if this individual has the authority to file the report. The non-district employee will need to provide their "User ID" from another established PI-1500 site to complete the first step. 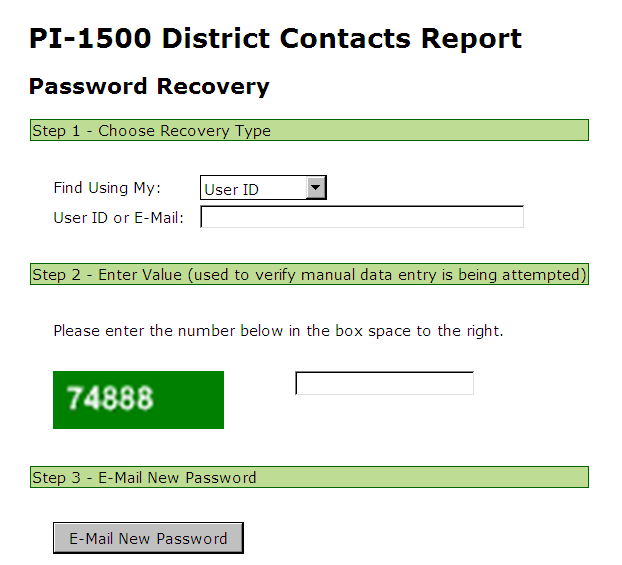 The Superintendent or designee will log in to the PI-1500 portal. Click on the "Add User" button in the upper right-hand corner. Enter this non-employee’s "User ID" and click the "Add" button. The pop-up screen will change, indicating whether that "User ID" is already in the system or is not in the state-wide system. NOTE: This non-employee’s profile will be filled automatically with information from the other PI-1500 site. Any changes made to this individual’s profile will change that same information in the other PI-1500 statewide locations. At the "Report Access" tab, this individual can be granted access or have it removed for the reports listed for your school district. At the center-bottom of the information is the Log-In box. Please click "Change your password." Click "Change Password." The screen will change with this statement "Your password has been updated." If an error is made between the two password entries, the screen will change with this statement "The new password and confirmation password did not match" and symbols will indicate the location of the errors. 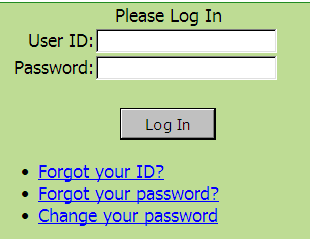 An error in the User ID will stop the process with a statement inserted, "User ID does not exist"
At the center-bottom of the information is the Log-In box. Please click "Forgot your ID?" In the green box, below the "Log In" button, is the link that will take you to a new webpage where you will need to answer the following questions and click the "E-mail ID" button. If an unknown email address is entered, an error message will stop the process with a statement inserted, "Could not find the email specified." When done correctly, your ID will be emailed to the address entered. At the center-bottom of the information is the Log-In box. Please click "Forgot your password?" In the green box, below the "Log In" button, is the link that will take you to a new webpage where you will need to answer the following questions and click the "Email password" button. When completing a Password Recovery, the individual will need to decide which of the two options for personal information, ID or E-Mail, will be entered. This will be a computer generated password; it is recommended that the directions in the email be followed to change your password to something you can easily remember.